Today I ran in bib number 666 and came 13th. I’m not superstitious but was a bit wary of running in this bib number, so much so that I’d tried taking scissors to it and running as 66 until I realized I’d have to cut through the strip that records the chip time. After running my fastest half marathon for three years – in fact this very same race in 2012 – I figured the bib number and finish place were not so unlucky (and my Chinese friends advised 666 was indeed lucky). I did however destroy the bib as soon as I crossed the line. I was nervous ahead of today’s race. More than normal. Having scorched to 53:36 in the Bronx 10 Mile last week I was worried the legs and heart would not be game for my longest race since 2013 barely 7 days after running on the Grand Concourse. Sham and I drove in and parked at Marcus Garvey Park. I then ran the 4 miles to the start just south the Tavern on the Green. Conditions were mixed – ideal temperatures in the low 50s (F) but cloudy and windy. I’ve run this race many times. It’s often a club points race but more importantly it’s way for me to pay tribute to Grete Waitz by running a race in her honor. Since I can remember this race has been run clockwise – for two and a bit laps of the park – but this year’s route (Download Course Map (PDF)) was counter- / anti-clockwise and the final few meters took in the gentle ascent up the 72nd Street Transverse. As last week soon after the start I settled in behind a group comprising a posse of New York Athletic Club (NYAC) (Gian-Paul Gaccia, Jmaes Kelly and Thomas Young) and West Side Runners (WSX) (Roberto Puente and Alejandro Ariza). We were clipping along at 5:20-22 mpm pace through to around 4 miles – reached in 21:26 – but then the NYAC members stepped it up and Roberto, Alejandro and I drifted off the back. I then found myself running alone. And until the last half mile it would stay that way. Fortunately I was able to maintain 5:26-30 mpm pace, sufficient to meet my target finish time of sub-1:12. Running isolated at around the 6 mile mark. Sid Howard is bellowing support and telling everyone I’m 49! This half marathon – like all big races of two laps or more in the park – suffers from congestion as faster runners on their second lap overtake slower competitors. From around mile 8, reached in 43:20, I started lapping runners in large numbers. Some inadvertently run wide so the lapping runners like myself end up running outside the cones. It’s hard to know how this can be averted. Perhaps the answer is two lanes demarcated using cone and tape. Out on the course I got great support from friends – all runners and those that support us are my friend. A special mention must go to Sid and Asteria Howard. Few couples, if any, give so much to running and runners young and old. With barely half a mile left to run I comforted myself that a sub-1:12 was in the bag. 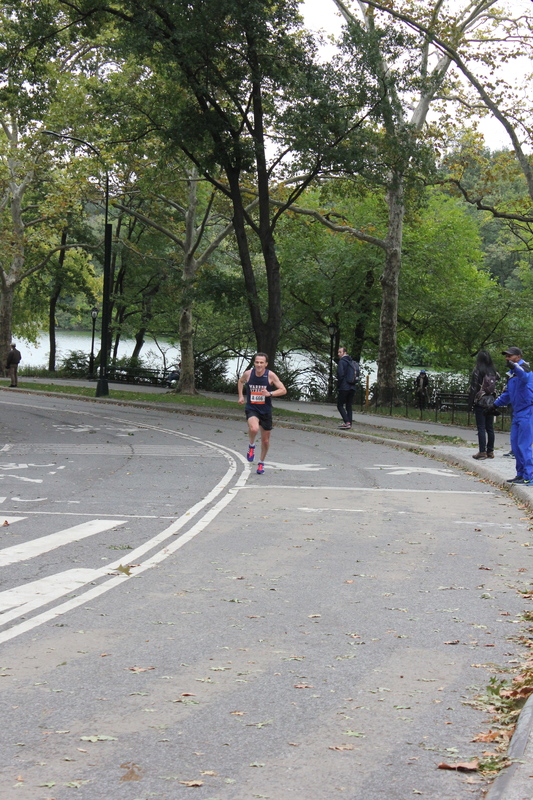 Then Matthew Lacey, Central Park Track Club (CPTC), breezed past. As we approached the finish we then had to navigate the lapped runners to get an inside line in order to make the left turn onto the 72nd Street Transverse for the final 150m finishing straight. The slight rise up to the line sucked out what little I had left. I crossed the line in 1:11:35, good for 13th overall, 1st masters and 1st age-graded (92.74%, my second highest ever). A sub-1:15 also qualified me for championship entry to the London Marathon. Here are some more race photos. In the men’s race, the West Side Runners, led by Ayele Megersa Feisa, solidified their club points lead by taking today’s top-five spots. The New York Athletic Club strengthened their women’s first-place ranking with a photo finish by Jeanna Composti and Megan Hogan with Composti taking the win. The Warren Street turnout was disappointing, not surprising perhaps given we pulled out all the stops at the Bronx 10 Mile. This race attracted almost 4,400 runners, many doing their last race before the New York City Marathon. But there were no Norwegian festival with its Nordic goodies to replenish spent energy. Overall it felt a shadow of the race that many of us came to love, the race that honors the world’s greatest ever female distance runner. The Bronx 10 Mile partly stole the show. I do hope NYRR find a way to return this race to its former glory. We owe it to Grete. 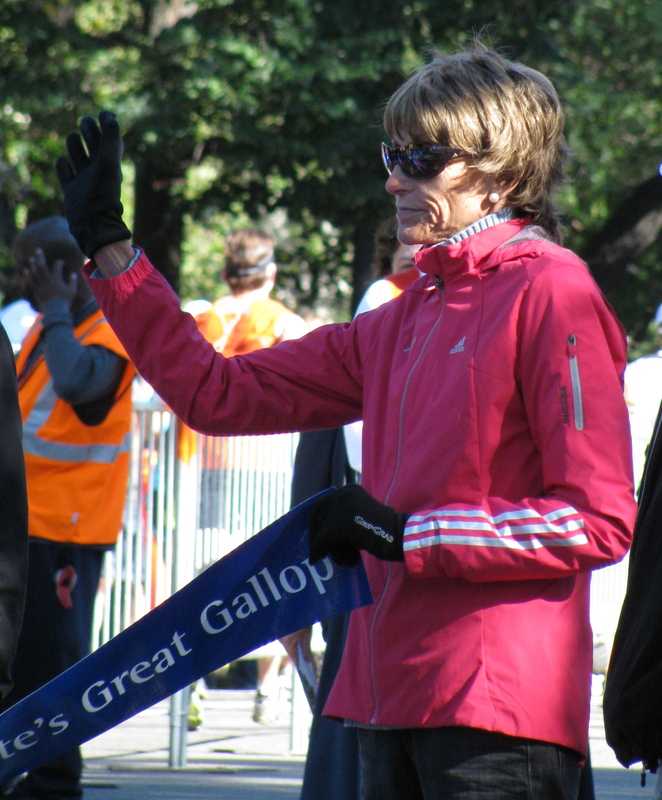 Grete at the start of the 2009 race – she would stand on the podium to wave the runners off and then be there at the end to see them come in. This entry was posted in New York, Races, Running and tagged central park, Grete's Great Gallop, half marathon. Bookmark the permalink. Paul I am your age and struggled to a 1:20.04. I took 20 years off and have been back for 2 years. I really have no idea (apart from raw talent) how you are doing what you are doing. Keep up the good work you are really an inspiration. Brad you might want to check out my log on the blog (!). I don’t record everything on Strava, just selected runs. Brad I think I have average talent but found a way to optimize what I have and grow old gracefully, the latter helped by my modest mileage.